You're excited about VoIP. You're salivating over the juicy benefits and fattening of your wallet that comes with implementing a VoIP phone system . Your cravings are understandable. Who wouldn't want to tear into the meat of an implementation that promises so much? But before you go about carving out a budget and selecting that prime system there are a few questions you should answer. What type of phone system best fits your business? Advances in IP communications have made it possible to have a fully functional phone system hosted by your service provider (known as Hosted VoIP) in addition to a premise based phone system . In general if your phone system is going to be used by more than 25 users a premise based solution will be your best choice. If you business phone system will have less than 25 users, you should look at both hosted and premise based solutions. Why are you looking for a new phone system? Besides the fact that you need to send and receive phone calls, what are the most important things that you are looking to get out of your phone system? Truth is most VoIP phone systems are similar. The only thing that separates one from another is how they are marketed. This is why it is important for you to know things like, are you looking for auto-attendant, voicemail, voicemail-to-email or find-me-follow me capability? Make list of all of things that you need to get out of your new system in addition to the things that would be nice to have. Will your phone system integrate with other business systems? One of those juicy benefits you hear about is the ability for a VoIP phone system to integrate with other business systems like your CRM or ERP platform. Some systems offer API's for integration with certain software, however other phone systems do not offer this capability. You should know which business systems require integration with your new VoIP system before you approach a vendor and ask about integration when you are being presented a solution. 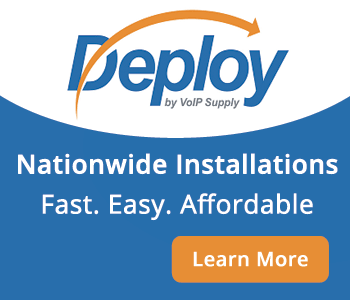 Will you be deploying, maintaining and supporting the phone system yourself? If you have a capable IT staff chances are you will be able to deploy and maintain the system yourself. If you do not have an IT staff you might want to consider looking into a hosted VoIP solution or select a capable reseller that can provide these services for you. Who will be providing your voice service? Don't make the mistake of buying a phone system before you figure out who will be providing the phone service. If you are going to be using VoIP ensure your VoIP provider is compatible with your phone system. If you are going to use both VoIP and PSTN service your phone system vendor needs to know this so that they can offer you the proper solution. You love the fact that VoIP can save you money, but will it? You need to look at the total cost of owning a VoIP phone system. Buying purely on price will get you into trouble: more reliable, expandable systems do tend to cost more per user up front. The savings you will see in the long run though make it worthwhile. As your company grows you will want to add users to your system, so find out how easily the system can be upgraded as new features and technologies are released. Even if it is last in the list this is very important for you to consider. Each employee or employee type has different needs that you need to meet. Prior to purchasing a system you should ask each of them what they would like to see out of a phone or phone system. This will allow you to align their needs with the benefits of a particular system. Remember, sometimes it is best to let the sweeper select the broom. Hopefully you can last just a few more minutes because there is something important you need to know. If you follow this advice and walk through each of these steps you are going to find other questions you will need to answer. But that's the point - you need to go through the proper steps to make sure that you are selecting the right VoIP phone system. And the folks at VoIP Supply can help. These VoIP experts can build you a system from the ground up that is stuffed with features and loaded with benefits for less then you'd expect.